Sign-Up for Jade Kintex UltraScale Updates! Sign-Up for Cobalt Virtex-6 Updates! Sign-Up for Onyx Virtex-7 Updates! Sign-Up for Talon System Updates! Sign-Up for Flexor FMC Updates! Dane Du Plessis is interested in multistatic ISAR imaging and has an undergraduate background in physics and electrical engineering. Currently, he works on system integration of NeXtRAD with several other team members. Pentek has added new features and enhancements to its Talon® SystemFlow® software that improve the ease-of-use and recording capabilities of the entire line of Talon Recording Systems. The optimized enhancements to SystemFlow benefit radar, SIGINT and communications recording applications where reliability, speed and data integrity are mission-critical. SystemFlow is the software interface that is integrated into every Talon recorder. The software includes the graphical user interface (GUI) that is used to control the recorder with point-and-click configuration management, a client/server communication interface, NTFS file system support, and an application programming interface (API) for custom user applications and control. 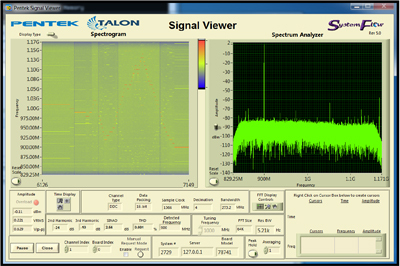 Signal analysis tools include a virtual oscilloscope, spectrum analyzer, and spectrogram to monitor signals before, during, and after data collection. SystemFlow GUI: SystemFlow features a Graphical User Interface that provides a simple means to configure and control the Talon Recording System. SystemFlow Signal Viewer: SystemFlow includes signal viewing and analysis tools that allow the user to monitor signals prior to, during, and after a recording session. These tools include a virtual oscilloscope, a virtual spectrum analyzer, a spectrogram display and a display of signal measurements. Client/Server Communication: The SystemFlow Client/Server architecture allows the recording software server to communicate with the client user interface through a standard socket connection. This allows users the ability to control the Talon Recorder from a remote PC over Ethernet. SystemFlow API: The SystemFlow API (Application Programming Interface) allows users to develop a custom user interface to control the Talon Recorder. Source code is supplied for all client API functions. NTFS File System: Talon Recorders use the Windows native NTFS file management system. This allows immediate access to recorded data, eliminating time-consuming data conversion processes required with proprietary file management systems. It also allows immediate access to the recorded data by third party analysis software like Matlab. Auto File Naming: System operators can select an auto-file naming facility to simplify setup. Files are named intuitively based on date, time-of-day and channel information. One-Click Profiles: System operators can save an unlimited number of unique system configurations and then retrieve any configuration with a single click, minimizing mistakes made by field operators. Auto-Initiated Recording: The Talon Recorder can be setup to automatically start a recording at a specified time and date. Coupled with a GPS receiver that supplies a 1 PPS pulse, the system can automatically start a recording at a very precise GPS-locked time. Segmented Recording: A segmented recording option allows large recordings to be broken up into smaller, manageable files. Operators can select their desired segment size. GPS Time and Position Stamping: Talon Recorders offer an optional GPS time and position stamping facility. By locking the system to the U.S Global Positioning System, recordings can be precisely time-stamped. Optionally, GPS position information can be recorded to the file header as well. GPS Position Tracking: An option to periodically track the GPS position of the system during a recording is available to users that are recording signals while in motion. This is particularly useful during flight missions, where RF signals are acquired during flight. Latitude, Longitude and Altitude coordinates are recorded and time stamped periodically. Pulsed Radar Recording: Some Talon Recorders offer the ability to record pulsed signals, allowing the system to record only when a gate is open. The Talon Recorder creates a metadata packet file that is recorded along with the pulse train. Each metadata packet provides information about the corresponding pulse, including the pulse number, time stamp, and pulse width. This metadata packet stream can be used to reconstruct the pulse train with the exact timing in which it was recorded. 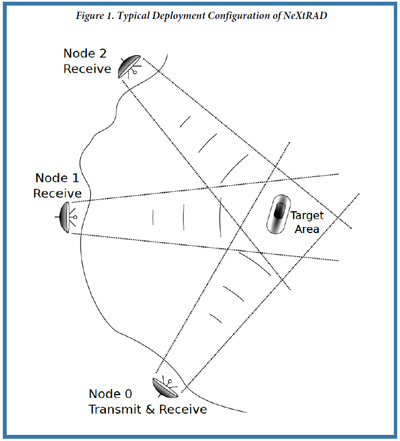 This is useful for radar systems, where the user only wants to capture the signal during the range gate. Data Extraction Utility: The SystemFlow File Viewer provides a signal analysis tool for analyzing a recorded data file. This tool allows users to quickly and easily scan through a recording to find signals of interest. Operators can use the built-in data extraction utility to copy interesting sections of the recording to a new file. This allows operators the ability to turn a large recording session into one or more small files of interesting data. Time stamping is preserved during the data extraction process. Looped Recording: Looped recording allows the Talon Recorder to run indefinitely while operators wait for an interesting event to be captured. Loop buffer size is selectable by the user allowing the recorder to have hours, days or even weeks of continuous recording storage available. AES 256-bit Encryption: Talon Recorders offer optional AES 256-bit encryption to provide data security. Instant Secure Erase: Talon Recorders offer optional Instant Secure Erase, to provide an extremely quick means of disk sanitization. For more information on Instant Secure Erase please click here. "Each of our customers has a unique recording need," stated Chris Tojeira, Recording Systems Director. "We've listened carefully to customer feedback and have added features and enhancements that expand the recording and display capabilities of our high-performance Talon recorders, all while making the systems easier to use."